There are many new cuts available today in the market. Unlike some other cuts the uniqueness of the TYCOON CUT is that its visible to the naked eye. The TYCOON CUT design adds more fire and brilliance to the diamond. The step-cut pavilion design allows the color to show higher than actuality. The 9 crown facets design hides inclusion better than the traditional square table. 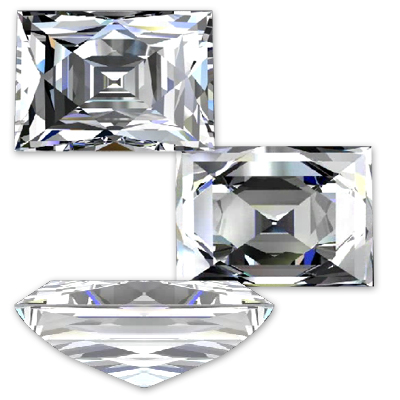 The TYCOON CUT diamond is available in the following shapes: Rectangular, Tapered, Square, Trapezoid, Cut-corner. It is also available in a variety of gem stones: Blue, Pink, Yellow Sapphire, Ruby, and Emerald. Every TYCOON CUT diamond, 0.50 carat and larger, is serial numbered, GIA graded, and laser inscribed to ensure authenticity of the TYCOON CUT diamond. GIA was quick to recognize TYCOON CUT as a major contributor to the diamond industry. In 2003, the Kejejian cousins won the prestigious GIA League of Honor Award. The first TYCOON CUT diamond is on display in GIA's museum and a GIA classroom is named after the cut.